Eighteen months after the introduction of the iPad, 11% of U.S. adults now own a tablet computer of some kind. About half (53%) get news on their tablet every day, and they read long articles as well as get headlines. But a majority says they would not be willing to pay for news content on these devices, according to the most detailed study to date of tablet users and how they interact with this new technology. The study, conducted by the Pew Research Center’s Project for Excellence in Journalism in collaboration with The Economist Group, finds that the vast majority of tablet owners-fully 77%-use their tablet every day. They spend an average of about 90 minutes on them. Consuming news (everything from the latest headlines to in-depth articles and commentary) ranks as one of the most popular activities on the tablet, about as popular as sending and receiving email (54% email daily on their tablet), and more popular than social networking (39%), gaming (30%), reading books (17%) or watching movies and videos (13%). The only activity that people said they were more likely to do on their tablet computer daily is browse the web generally (67%). The survey also finds that three-in-ten tablet news users (defined for this study as the 77% of all tablet users who get news at least weekly) say they now spend more time getting news than they did before they had their tablet. Just 4% say they spend less time while two-thirds (65%) spend about the same amount of time. A third (33%) of tablet news users say they are turning to new sources for news on their tablet, sources they had not turned to on other platforms such as television or their desktop computer. And, more than four in ten (42%) say they regularly read in-depth news articles and analysis on their tablet. Tablet news users also say they now prefer their new devices over traditional computers, print publications or television as a way both to get quick news headlines and to read long-form pieces. Whether people will pay for content, though, still appears to be a challenge, even on the tablet. Just 14% of these tablet news users have paid directly for news content on their tablets. Another 23%, though, have a subscription to a print newspaper or magazine that they say includes digital access. Thus, the percent of these early tablet news users who have paid either directly or indirectly for news on their tablet may be closer to a third. That is a much higher number than previous research has found more broadly of people paying for digital content. Still, a large majority of those who have not paid directly for news on their tablet remains reluctant to do so, even if that was the only way to get news from their favorite sources. These are some of the findings of the study, which probed at three different levels the behavior of 1,159 tablet users and 894 who consume news on their tablet weekly. The study, conducted in the summer and early fall of 2011, assessed the penetration of tablets and the general activities people use their tablets for across a representative sample of the U.S. population. 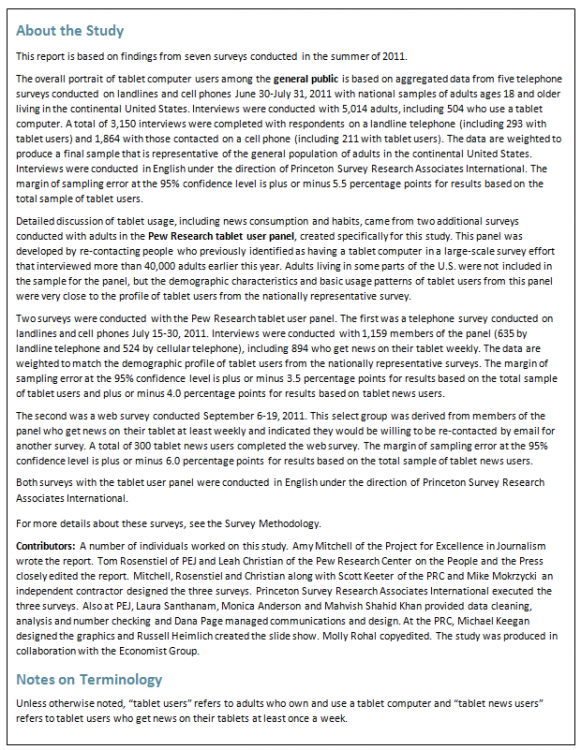 The study also probed deeply into how tablet users get different kinds of news and information on these devices and asked them to evaluate their experience using the device, including how that experience relates to other platforms. One reason early tablet adopters may have integrated the devices so significantly into their daily lives is tied to the demographic profile of the tablet-owning population. In general, they are middle-age, higher-income working individuals who follow the news more closely and more frequently than the population overall. The study also finds that these early users turn to the internet as their main source for news much more frequently than the public overall, and they have a strong preference for reading and listening to news rather than watching it-again much more than the population overall. Fully 71% of tablet users prefer reading and listening versus 45% of all U.S. adults. The way these tablet users consume news, though, may surprise some. When it was launched, many observers believed that the tablet might help change the experience of news consumers and the economic ground rules of digital news consumption. That belief was based on the sense that people would consume information on tablets largely through special applications or apps that provide content from a favorite news organization like the New York Times or one’s local newspaper. Users would download the apps, which news organizations might be able to charge for, and which could make advertising more appealing. The study reveals that, so far, while about two-thirds of tablet news users have a news app on their tablet, the browser, carried over from the desktop experience, is still the more popular means of consuming news. A plurality of tablet news users (40%) say they get their news mainly through a web browser. Another 31% use news apps and the browser equally, while fewer, 21%, get their news primarily through apps. There may be reason for news organizations to continue to develop and promote their news apps, however. Those tablet news users who primarily use apps for news are the most avid consumers of news on tablets. They consume news more heavily, and in more different ways. They also report higher levels of enjoyment and learning from their news experience. The revenue potential for news on the tablet may be limited. At this point just 14% of tablet news users have paid directly to access news on their tablet. Another 23% get digital access of some kind through a print newspaper or magazine subscription. Still, cost is a factor, even among this heavy news consuming population. Of those who haven’t paid directly, just 21% say they would be willing to spend $5 per month if that were the only way to access their favorite source on the tablet. And of those who have news apps, fully 83% say that being free or low cost was a major factor in their decision about what to download. Brand is important on the tablet. Whether an app comes from “a news organization I like” is as prevalent a factor in the decision to download an app as is low cost. Liking the news organization is a major factor for 84% of those who have apps. In addition, among both app and browser respondents surveyed about their behavior over the last seven days, the most common way by far to get news headlines was by going directly to a news organization’s content. Fully 90% of app users went directly to the app of a specific news organization, compared with 36% that went to some sort of aggregator app like Pulse. And, 81% of those who went through their browser accessed news headlines via a direct news website, compared with 68% who went through a search engine and about a third (35%) that went through a social network. Substitution is already occurring to large degrees. Fully 90% of tablet news users now consume news on the tablet that they used to get access in other ways. The greatest substitution is occurring with news that people used to get from their desktop computer. Eight-in-ten tablet news users say they now get news on their tablet that they used to get online from their laptop or desktop computer. Fewer respondents, although still a majority, say the tablet takes the place of what they used to get from a print newspaper or magazine (59%) or as a substitute for television news (57%). Incidental news reading is prevalent on the tablet. Nearly nine-in-ten (88%) of those who read long articles in the last seven days ended up reading articles they were not initially seeking out. In addition, 41% went back and read past articles or saved articles for future reading. Those who rely mainly on apps for news, 21% of all tablet news users, represent a kind of power news consumer. Close to half of this group say they now spend more time getting news than they did before they had their tablet (43%). That is more than twice the rate of those who mainly go through a browser (19%). App users are also more than three times as likely as browser news users to regularly get news from new sources they did not turn to before they had their tablet (58% versus 16% for browser users). Word of mouth is a key component of tablet news sharing. Fully 85% of those who get news on their tablets said they had talked with someone about a long article they had read there. This is more than twice the percentage who say they had shared articles electronically. Some 41% of tablet news users say they share news through email or social networking at least sometimes. And when a select group was asked specifically about their behavior in the last seven days, again about four in ten say they had shared news content through social networking sites or email. When it comes to ownership, many see the tablet computer as more of a household device to share than as a strictly personal one. Half of those with a tablet share it with other members of the household. And the iPad still dominates the market-81% of tablet owners in this survey own the Apple product.